Compared to standard size billiard tables, the smaller size of bumper pool tables makes them a great addition to a family recreation or game room. 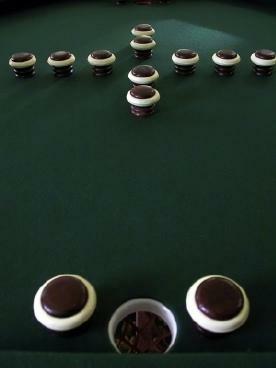 Bumper pool is a unique game played on a special table using pool cues and ten bumper pool balls. Tables for bumper pool have only two pockets compared to standard pool tables that have six pockets. One of the pockets, or holes, is located on each end of the table. Regardless of the shape, the table has bumpers built into it that make it more difficult to shoot your pool balls into the pocket located on your opponent's side of the table. The bumpers are also used by players as they attempt to sink their ball by banking a shot. Some players of bumper pool compare the game to a mixture of pool and pinball since the bumpers resemble those found on a pinball game machine. The number of fixed, cushioned bumpers depends on the size of the table. Typically a table has twelve bumpers, eight located in the center area and two on each end located next to the pocket. However, there are tables that have fourteen or sixteen bumpers. Although tables for bumper pool are available in different sizes, a regulation table is rectangular in shape and measures approximately 54 inches in length and is 30 inches wide. Just as many standard pool tables, the covering is often green felt over a base of either slate or wood. Players use standard pool cue sticks to play bumper pool. A very popular table style of bumper pool is the 3-in-1 table designed for dining, playing poker and bumper pool. These multi-functional tables fit perfectly into small spaces and are great choices for apartment living. The 3-in-1 game tables have a removable top that is easily turned over. Most of the tops have a beautiful oak, cherry or mahogany wooden veneered surface on one side and a poker table on the other. Once the tabletop has been completely removed, a bumper pool game surface is revealed. The most popular 3-in-1 table style is the 48-inch octagonal table set on a solid wood base. Octagonal tables are also available in a 42, 54 and 60-inch sizes. Round 3-in-1 game tables are also manufactured in the same sizes as the octagon tables. Rectangular tables for bumper pool vary in size from 30 x 48 inches to 46 x 62 inches. If you are looking for an enjoyable game for home entertainment, choosing one of the many styles of bumper pool tables available is sure to give you, your family and friends many hours of playing fun.